Contributed by Steve Paul Johnson [steve@cleardigitalmedia.com]. Recorded March 12, 2000. Total records = 9. The cemetery lies about 500ft behind the chapel. The chapel was established in 1830. 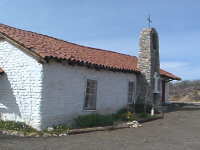 The cemetery contains the remains of Cupeño Indians who originally lived in the Warner Springs area. In 1897 an issue arose over the residence of the Indians. The owners of the land did not want them there, even though the Cupeños had lived there for unknown generations. The California State Supreme Court chose to evict them. In 1901, Theodore Roosevelt intervened by offering to buy the land from the owners, who at that time were the heirs of former California Governor John Downey. The heirs refused to sell. Roosevelt offered to buy a new home for the Indians. Cecille Blacktooth, leader of the Cupeños, refused to move. He replied, "You see that graveyard over there? They are our fathers and grandfathers. You see that eagle nest mountain and rabbit hole mountain? When God made them, he gave us this place. We have always been here. We do not care for any other place. It may be good but it is not ours...this is our home...if Harvey Downey says he owns this place, that is wrong..." In 1903 the Cupeños were relocated to the Pala Indian Reservation. A total of 62 markers were counted. 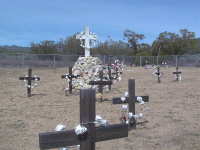 Most of them are wooden crosses with no inscriptions. To reach the cemetery, take State Highway 79 to Warner Springs. The Chapel lies on the north end of the city limits and is clearly visible from the highway. A dirt road leads up to the chapel, and beyond it is the cemetery. Hughes, Joseph S., b. 16 Aug 1927, d. 25 Sep 1996, "Jody", "US Marine Corps World War II"
Keane, Charles F., b. 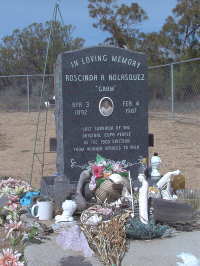 25 Mar 1935, d. 30 Aug 1997, "US Navy"
Nolasquez, Roscinda A., b. 3 Apr 1892, d. 4 Feb 1987, "Gram", "Last survivor of the original Cupa people in the 1903 eviction from Warner Springs to Pala." Taylor, Banning Vail, b. 19 Oct 1905, d. 24 Sep 1998, "The Boss", "Beloved Husband, Father, Grandpa, and Great Grandpa"
Taylor, Banning Vail Jr., b. 19 Aug 1936, d. 14 Jun 1986, "Skip", "Son, Husband, Dad, Brother"
Taylor, Theresa P., b. 19 Mar 1908, d. 15 Aug 1988, "Beloved wife of Arthur L. Taylor Sr. 55 Years", "Loving Mother and Grandmother"
Wilson, Hazel E., b. 25 Oct 1914, d. 22 Aug 1990, "Loving Mother and Grandmother"